The LAIR is working on autonomously exploring and analyzing lava tubes using a Jaguar Lite platform. This project is a cooperative effort between the LAIR, Harvey Mudd College's Physics Department and the Kinohi Institute. Groups of robots will be deployed at a lava tube entrance to navigate the tubes, investigate interesting locations, and record data. The robots are equipped with imagers and spectrometers and utilize intelligent pattern recognition to obtain optical biosignatures of microbial life. 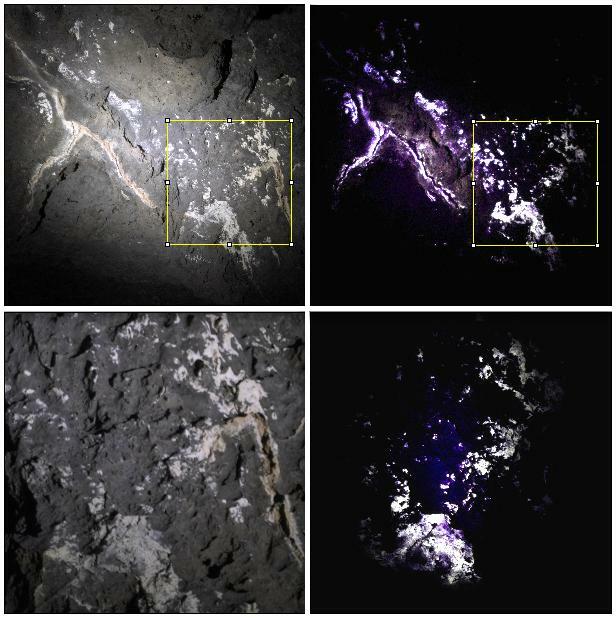 This imaging and spectral data would be non-contact, non-destructive, and obtained entirely autonomously without prior knowledge of the cave system. The field test location is a series of lava tubes at Pisgah Crater in the Mojave Desert. The selected tunnel is 2 feet high in most places, the floor is covered with fine silica sand, and there is a significant amount of debris. This site was chosen to model the cave system on Mars, which may shelter life from the harsh surface weather and radiation. 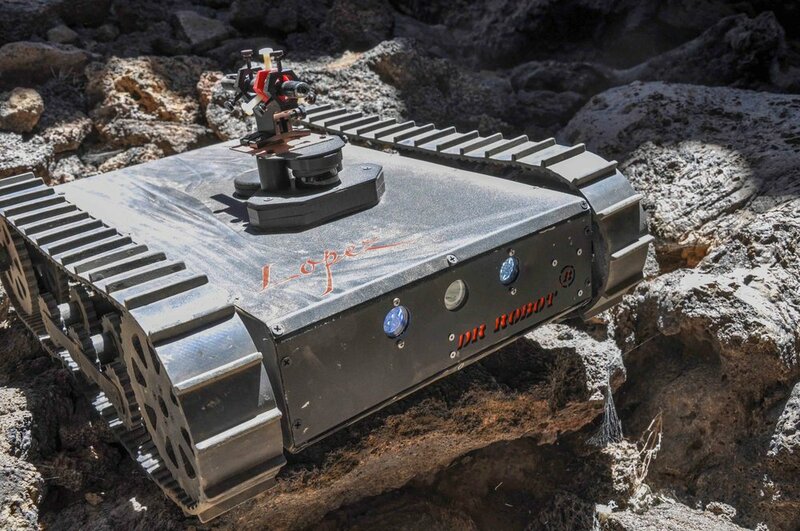 This project will serve as a proof of concept for autonomous cooperative rovers navigating, mapping, and searching for life in the caves of Mars. The optical prototype for detecting microbial life has been proven effective in laboratory and field tests. The process includes laser induced fluorescence emission (LIFE), Rayleigh and Raman scattering, and optical chirality. Samples containing chlorophyll, cytochromes, and hemoglobin are excited by 405 nm violet laser light. The emitted light is used to determine initial interest in a location. The Jaguar Lite robots are in constant communication and collectively plan desired paths to follow. The map is constructed and robot localized using a simultaneous localization and mapping (SLAM) algorithm. Navigation is performed using odometry and corrected with a feature-based particle filter. Overall path planning is performed using a discretization of the known environment and with constraints between cooperative robot motion. The development of the scientific instrumentation for the project has been graciously supported by grants from the Rose Hills Foundation, the Baker Foundation, the Sherman Fairchild Foundation, Edmund Optics Higher Education Grant Program, and the Shanahan Endowed Student-Directed Projects Fund.